MC-60 Indutherm Casting Machine Common Process for Melting The Table Top Casting Machine MC 60 V The compact solution for small series casting in gold, silver and other special jewellery alloys The MC 60 V has been developed with the user in mind for whom the MC 16 is too small but a simple machine from the large VC series (e.g. the VC 400) is too big or requires too much manual operation. This small high-performance casting machine is ideal for smaller production quantities and can be used for jewellery alloys such as gold, silver, copper and bronze, as well as for alloys of brass and aluminium. Thanks to the vacuum and overpressure functions and the many automatic control features, the machine provides first class castings with little work – suitable for “beginners”.Rapid and simple castingThe whole process of casting can be carried out simply, quickly and safely without any real prior technical knowledge of casting. In the investment machine the gipsum gets mixed under vacuum – correctly dosed and air bubble free. The flask with the wax model gets filled under vacuum, too. Vibration during filling eliminates air inclusions. The wax is molten off in the furnace and the mould is burnt out.For small series and single castingsAn important issue is the fast casting of master models or of semi-finished material in any desired shape: the MC 60 makes you autonomous from big casting departments. Thanks to the small size of the machine and its equipment, it is an excellent solution for studios and goldsmith workshops with limited space.Main benefits Very simple use, short training period, very good results even by operators with less experience in casting techniques Excellent price-performance ratio 3,5 kW generator enables quick melting periods Thorough mixing of metal by induction generator (low frequency tuning) Melting under vacuum for reduced danger of oxidation Excellent mould filling because of inert gas / over-pressure, max. 2 bars Low running costs because of inexpensive consumables and the use of flasks without flange NEW: LCD-display with all program data NEW: vibration technologyExcellent ratio machine size to capacity: flasks up to Ø 100 mm x 120 mm hTechnical Details: performance performance max. 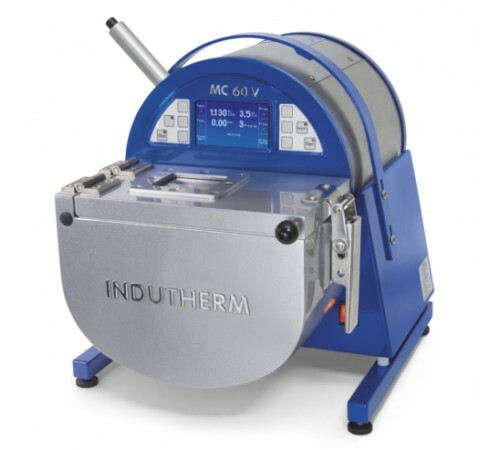 / electrical connection 3.5 kW 230 V single phase maximum temperature 1300° C capacity crucible volume 450 g Au 18 ct 300 g Ag 935 for use of flasks up to ø 100 mm x 120 mm H handling+control control panel digitales Display vacuum or overpressure after casting -1 up to +2 bar temperature measurement/control up to 1.300° C accessories vacuum pump (min. 8m3/h) ..